Hailing from Delft, close friends and music lovers Bart Riem and Sam van Wees, team up as Mr. Belt & Wezol, a playful DJ duo that combine elements of house music to create energetic tracks and sets that move dance floors. Though their monthly “Mr. Belt & Wezol Room” podcast is a spoof on super hip Boiler Room sessions, their music is anything but a joke. In the summer of 2013 they literally went to a different festival every week and instead of hanging out at the main stage they were enjoying the smaller deep house stages. This is where their idea of becoming Mr. Belt & Wezol was born. Since then, they’ve bonded over their love for dance music by raving away to UK and deep house music at festivals and by producing music of their own. Before they became Mr. Belt & Wezol, Bart’s focus was on eclectic house and Sam’s love was progressive house. Now these individual styles contribute to their groove-laden mixes, which are often referred to as “future house”, but cannot be defined by any one genre. 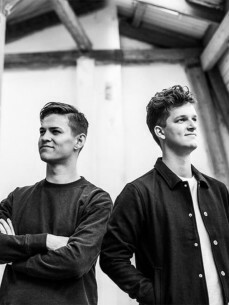 This unique sound is best portrayed in the duo’s first joint track, “Homeless”, which establishes Mr. Belt & Wezol as innovators in creating light-hearted dance tunes.